There is great interest in calculating accurate values for Earth’s palaeogravity since the results have profound implications for many sciences. One fundamental technique to quantify palaeogravity is to compute weight against mass estimates of ancient animals. 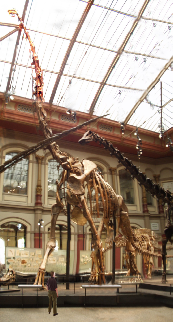 In this paper this technique is applied to Giraffatitan (=Brachiosaurus) brancai (MB.R.2181, formerly HMN S II), one of the most complete sauropod dinosaur skeletons known. The results indicate that a palaeogravity of 0.54g (5.3 m/s2) ± 20% is a reliable estimate for 152 Ma.